05.26.11: Leo is: Still sick?!! Leo just finished a fourth course of antibiotics, and it’s a fair guess that he still has the double ear infection that has been muffling his hearing, souring his mood, interrupting his sleep and presumably really hurting him for almost 2 months now. We’ve couldn’t get an ENT appointment before next week, and in the meantime we’ve tried to communicate to his teachers that his often angry behavior is a reflection of his health woes, not his personality. But I have a hard time with the whole concept myself. In theory, it’s easy to say that your child’s poor behavior is understandable when he’s sick. But when he’s sick…usually…and his behavior includes moments like the one last weekend when I told him to stop throwing toys and he hurled a large toy piano across the room…I find it hard to know what to do. Yell at him? Remind him he’s not feeling well? Both? When he was younger, those were the moments when I’d strap him on my back in the Ergo and just. move. I think that’s still key: how to regain fluidity when he and I get stuck. No, the behavior is not okay, and he needs to know that. But how to get past the stand-off, and fast, before the next hurled object? Often it’s still a matter of physically moving my great big gangly three year old, scooping up his limbs and carrying him to another room to look out the window, start a cooking project, or read a story. And when the storm passes for him, as it often does as suddenly as it came, all is well again and he’s an engaged, intent little person who wants to do everything. I worry a fair amount these days. How are Leo’s ear infections affecting his language? His socialization? His self-image? Will they suddenly become much much worse? Aren’t their tragic cases of antibiotic-resistant infections in children? It doesn’t help that my boss, a holistic nutritionist, responded to the whole story by telling me that the damage antibiotics do to your body’s healthy bacteria can cause problems at any point in life—even resulting in autoimmune diseases years later. I don’t know how common this is, but I’m planning to redouble the probiotics, and in the meantime, we’re eating yogurt at every opportunity. We even hauled out the ice cream maker to churn our own Blueberry-Maple Yogurt Ice Cream (a super-simple recipe that you can make without an ice cream machine too). 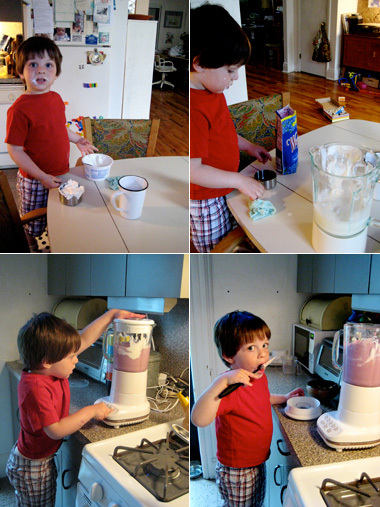 Leo loved measuring the blueberries and yogurt, and operating the blender. 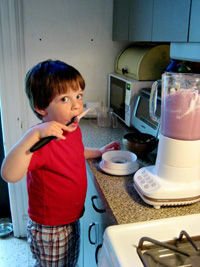 And watching him gaze into the ice cream maker as it churned the deep purple creamy mixture did my heart good.